A pet's particular signs will depend on the type of poison eaten (the active ingredient), as well as the amount eaten, the pet's weight, and the amount of time that has passed since they ate it. If you notice any of these signs in your pet and know or suspect that they may have eaten some rat or mouse bait immediately call Animal Poison Control or take them to a veterinarian for evaluation. Time is truly of importance with rodenticide poisonings. Even if you're not seeing any of these (or other) clinical signs in your pet, if you know or suspect that they have gotten into a rodenticide, you really do need to immediately call Animal Poison Control or take them for evaluation by a veterinarian. Rodenticides are very good at their "job"... killing. And these compounds don't care whether they're in a rat/mouse or your cat or dog, they are indiscriminate killers. The sooner you get your pet the veterinary attention they need, the better the odds of their survival. Even if you’re not using rat and mouse poisons in or around your home, exercise great caution with your cats and dogs this time of year, as your neighbors or even your local parks department and businesses may be doing so. And keep this in mind too when traveling with your pets, as some hotels or rental homes may use rodenticides inside or on their grounds! 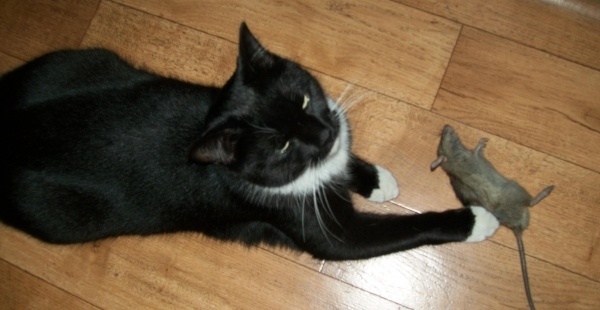 Pets can also be affected by eating poisoned rodents! While many of the more common rodenticides kill by causing prolonged bleeding, not all do! Some kill by causing kidney failure, while others kill through their devestating effect on the cellular metabolism throughout the body. This difference in "mode of action" is extremely important, as they each carry their own prognosis and require different treatment. Check out this article for more information on the differences (i.e., how they kill) between the various types of rodenticides. Keep dogs on leashes and in fenced-in yards. 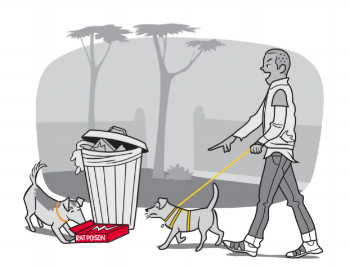 Don’t let dogs scavenge on walks — especially around parks, schools, and restaurants. Keep all rodenticides in your home well out of reach of your pets. This applies both to the pieces of poison laid out, as well as the rest of what's left in the box or bag. Use only the newer "pet-safe" bait stations like this one (but research which product is best for your situation and environment if such poisons are to be used in and around your home). 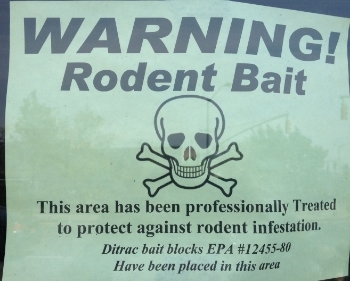 Work only with exterminators who use pet-safer methods of rodent control. Ask your neighbors not to leave any rat or mouse poisons in their yard, or to let you know in advance if they plan to. Ask about and double check in and around any hotels/motels or rental apartments or homes you stay in with your pets while traveling. Tail of Woe: I once treated a family's TWO Jack Russell Terriers for inadvertent rat poison ingestion after the dogs discovered and ate the blocks of rat poison that had been laid out by the previous owners and left behind under the deck of the house the dog's people had bought just two weeks before. Fortunately they both survived, but it was touch and go and certainly took a toll –– both financially and emotionally –– on the dogs' family. Rodenticides are indescriminate in who or what they kill. So please, if you use them, do so only with extreme caution and take the steps necessary to keep your cats and dogs safe from their potent effects.